It must be the season for planning weddings. Not only did one of my best friends get engaged (congratulations Henry) I had two questions this week about what to wear as a groom. KL: Mr Crompton, I’m an avid reader of your blog and I’ve loved your posts on what to wear to a wedding. I’d love to hear more of your thoughts though if you were the groom at an informal wedding. I’ve been thinking of a couple of possibilities like a grey 1b peak w/ db vest, navy db, navy 2b peak sb, navy/grey Hunstman-style 1b suits. I have a houndstooth Macclesfield or a champagne tie that I love and may wear for personal significance. Peter: Dear Simon, I am a long time reader of Permanent Style. Happily, I am getting married this summer – in the middle of August. There is pressure from the bride for this to be a formal wedding, but her definition of formal doesn’t extend much beyond a dinner jacket and black bowtie. I am not certain that that is entirely appropriate for a church wedding and would like to wear something a little more personal. My initial thoughts are: Black, SB, notched, black silk lapel, possibly with an heirloom silver button (instead of a silk-covered button). Black trousers with silk along the seam. Waistcoat in a dark, dark green (Favourbrook has some nice ones). White shirt, black tie (not bowtie), white pocket square. Now my opinion on wedding attire can be summarised in the following, hopefully logical, points. First, propriety is king. So if there is an obvious dress code, either stated or implicit, stay within it. Do not upstage anyone, especially the groom. Be smart enough, even a little smarter than the rest of the guests, but do not stand out like a sore thumb. This is not your day. And if the dress code is black tie, much as I hate that American tendency at daytime weddings, wear it. Second, if there is no obvious dress code other than being smart, feel free to take it down a notch sartorially. I know that, as a formal day event, you should be wearing morning dress, and if not that then the smartest lounge suit you own: navy single-breasted, crisp white shirt, black oxfords, probably a grey or silver tie. But that’s too near business dress to be any fun these days. Men never get a chance to wear casual suits, linens, cotton and silk, let alone bright colours. So go wild and enjoy it when you can. Otherwise no one would wear checks or spectators. My general opinions stated, let’s turn to the questions. Both KL and Peter are keen to go down the formal route without wearing black tie or tails. Good for them. KL has the right idea on dressing up the lounge suit, going for peak lapels and a double-breasted waistcoat. These are both great ideas, particularly if you will rarely wear them on any other occasion. Either navy or mid-grey, with either tie. Peter is seeking more to put a personal spin on black tie. 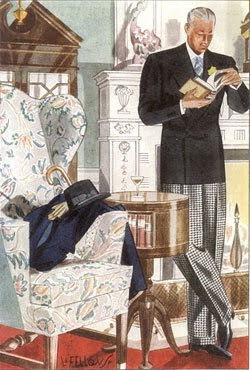 This can be done in a number of ways, including a shawl collar, double-breasted, even a velvet jacket. But if you’re going to do black tie, Peter, eschew coloured waistcoats. The jacket should have peak lapels and you need something to cover your waistband – cummerbund, waistcoat or double-breasted. Or how about another suggestion Peter? An old-style stroller (above) – black, SB or DB, peaked lapel jacket in serge or cashmere. Pale grey trousers, white shirt, white handkerchief, Macclesfield tie, black shoes. Keep it monotone. It’ll looker smarter than what everyone else is wearing, but individual too. You can follow the discussion on Two questions on wedding attire by entering your email address in the box below. You will then receive an email every time a new comment is added. These will also contain a link to a page where you can stop the alerts, and remove all of your related data from the site. The fellow in the picture isn’t wearing a stroller—at least, not what I’ve seen described as a stroller (a morning coat). I had a fantastic time wearing morning dress to my daytime wedding. Everyone thought they looked quite dashing. But, they’re pricey to buy and I was really not satisfied with the hired ones. Also, ascots (if one were inclined to go for the traditional wing collar and ascot instead of a four-in-hand) can be hard to come by. I got mine from this company. Titus, a stroller is not a morning coat. It is short in the back and, in that way, is to a morning coat what black tie is to tails. It is peak-lapelled, usually single-breasted and often has cloth-covered buttons. The biggest difference between it and a normal suit jacket is the accessories – striped trousers, matching or pale grey waistcoat. It is usually black or grey and used to be worn often by staff. The man pictured here, however, clearly not staff, is wearing a double-breasted version. I am at the moment planning what to wear at my own wedding and have decided to wear a kilt. I was wondering if a charcoal tweed jacket and vest would be too casual. Also should I understate the rest of the outfit because of the vibrant tartan? I have been invited to a daytime/ outdoor event with a fairly strict dress code in terms of morning dress, black/ grey, tie no cravate, no colour bands to the top hat etc. For shoes however it simply says black. Now, I assuming oxfords but would it be patents or not for a day event? Clearly not full wingtip with brouging but how about just brouging along the edge of the toe cap? Definitely not patent – they are for evening. And the less broguing the better, but it’s not a huge thing. I’d go with your half brogues, given budget constraints.